It has been a year since we launched and populated our "Student Observation Projects" page (https://www.aavso.org/student-observation-projects), and I woudl like to hear from you about projects you have pursuit with your students! Can you please share? Student Projects -- Ideas Needed! 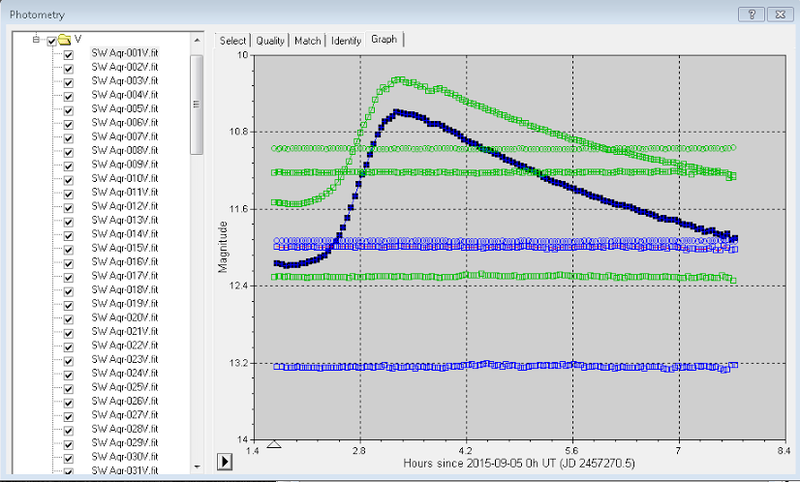 I've worked with a number of high school and college students on photometry-based projects, ranging from near-Earth asteroid light curves to the more typical short pulsators, most often RR Lyrae stars, as well as eclipsing binaries. These are great projects for learning the analysis steps, and if timed right, only one night's observations are needed. For an interesting twist, 2-color observations can be made (usually B & V), so the change in color temperature can be observed. I'll attach a B & V time series done in MaxIm DL to illustrate. Now i'm looking for a few very special targets. The ideal candidates would be interesting short-period variables that also have interesting spectroscopic features that can be detected with a diffraction grating in the filter wheel (low resolution). The equipment is a 17" aperture and a nice Apogee CCD camera with BVRI photometric filters, and an SA-200 in the filter wheel, yielding 11.1 angstroms/pixel. Photometric targets work well from about 8th mag to about 16th, with a spectral range of perhaps 6th - 14th magnitude (with stacking). I've played around with the AAVSO Target Tool, and it seems there are some possible eclipsing binaries that involve Wolf-Rayet stars, which might be really fun. I don't HAVE to have targets that are good for both photometry and low-rez spectroscopy, but it shure would be nice, and could make an interesting paper at the end. If anyone has ideas or even favorites thay woudl recommend, I'd be much obliged, as Andy & Opie used to say. Ideal target limits would be 0 - 10 hrs RA, and northern hemisphere, or not much below 0 DEC -- perhaps -10 -- as we typically don;t use the lower shutter in the winter.